I’m on holiday at the moment but Google has kindly sent me this story from the East London Advertiser. A Tower Hamlets Labour councillor has resigned today blaming it on the Tory government’s NHS cuts. Weavers councillor Anna Lynch, who worked as a nurse at the London Chest Hospital in Bethnal Green, said she is having to move to Somerset for work. A by-election for her seat will be held on May 3 coinciding with the London Mayoral election. Cllr Lynch said: “It is with sadness that today I resigned as a councillor representing Weavers ward. I work in the NHS and as a result of the Tory-led government’s cuts, I have had to move out of London for work, making it impossible to continue to keep my commitment to represent those that elected me. It is understood the Labour Group will shortly select a new candidate to fight the by-election her resignation causes. “We will fight hard to elect a new Labour councillor to stand up for Weavers residents”. Another Tower Hamlets by-election will be held for Spitalfields and Banglatown ward on April 19 after disgraced independent benefit fraud councillor Shelina Akhtar was barred from office. Last month, I published the list of Lutfur Rahman’s mayoral advisers. The list, which was provided by Tower Hamlets council, included the name Gulam Robbani and stated his role was to advise on “on adult social care and health for one day per week at a cost of £40 per hour”. Robbani, of course, was Lutfur’s agent in the October 2010 mayoral election and is now the independent candidate for the Spitalfields by-election on April 19. So let’s hope he and Lutfur can explain exactly what sort of advice he has been offering because I think the following letter from John Williams, the council’s head of democratic services, to Tory leader Peter Golds will cause a fair few heads to be scratched. Thank you for your Member’s enquiry regarding G-Social Care. Since the Mayor was elected in October 2010 G-Social Care has been involved with the Council to provide advice to the Mayor on the Health and Wellbeing of Adults and Children. G-Social Care was awarded a contract in accordance with the Council procurement procedures which commenced on 3rd February 2011. This contract was completed on 3rd July 2011. From 3rd February 2011 to 3rd July 2011, G-Social Care received direct payments under this contract of £4,400. Following a tender exercise and procurement process in accordance with the Council’s procedures, G-Social Care was awarded a further contract which commenced on 17th October 2011. From 17th October 2011 to 31st January 2012, G Social Care was paid £40 per hour and received direct payments under this contract of £13,080.00. This contract was suspended from 1st February 2012 at the request of Mr Gulam Robbani of G-Social Care. G-Social Care have not received any funds from the Council by way of grant. Previously, Children’s Services spot purchased services from G Social Care during the course of the financial years 2005/6 to 2008/9. The last time that any services were commissioned from them by Children’s Services was in 2008. Over the period of time specified, a total of £62,311 was paid to them for the services provided which were for contact services for children looked after, for interpreting services across the service, for accommodation for no recourse to public funds cases and for support to CIN cases. There do not appear to have been any grants made to them. Records at Companies House show that G Social Care is owned by Robbani (99 per cent shares) and Nafisa Nagris Robbani (one per cent). It seems therefore that Lutfur is being advised not by Robbani but by Robbani’s company. Another way of looking at this is that Robbani was paying himself through a limited company at the lower rates of Corporation Tax. There has been great deal of fuss about such tax avoidance arrangements in the civil service recently. There is another issue here as well. Until it was awarded the Mayoral adviser contract, G Social Care Ltd was merely a supplier of translating, interpreting and counselling services. It advertised on the Community Care website here in 2006, a year after it was established at the London Muslim Centre, when its hourly rates were £18-20 an hour. That’s half the £40 it now charges for “advice”. The letter above states that £4,400 was paid to it between February 3 and July 3, 2011: if that was at £40 an hour that’s 110 hours of “advice” over 22 weeks, which implies his contracted one day per week was for five hours (110/22). The “further contract” commenced on October 17, 2011, and ended at Robbani’s request on January 31 (a few days after Shelina Akhtar’s guilty plea raised the probability of a Spitalfields by-election). That’s a period of only 15 weeks, yet the company was paid £13,080, triple the amount under the previous 22 week deal. There is something odd about this. We have an official list from the council saying his contract is one day a week at £40 an hour. His working day seemed to be 5 hours a day in the first part of last year. If that remained the same under the renewed contract then we’d expect his company to have been paid £3,000 (15 weeks*5*£40). In fact, the £13,080 he was paid for those 15 weeks works out as 327 hours (£13,080/£40). His contract was for one day a week, so if we divide 327 hours by 15 days, it implies he was working 21.8 hours a day. Now, that can’t be right. So what else can be included in that £13,080? If there are any translating or interpreting services included in that amount then that’s a very different contract to mere “advice”…Robbani and the council have some explaining to do. There’s something else worth pondering: we’re told the company was paid £62,000 by the council between 2006 and 2008. Well, that didn’t exactly boost the company’s health. Accounts lodged at Companies House show net assets of just £332 at Dec 31, 2007. They soared to £391 a year later. All in all, a very curious business for Mr Robbani, who, I understand used to work for the council’s social services team…(if anyone has more information on that, please email me). There is another curious element to this tale. Robbani lists his company’s service address at Companies House at an address in Sexton House, which is a new block in Virginia Quay, Blackwater. According to the Electoral Roll he used to live there until 2008 and it’s likely he still owns it and rents it out. However, on the previous electoral roll at that address his name is spelled as Ghulam Robbani. He is now registered at a maisonette in Cottage Street, Limehouse (the same address where his company operates from), as Gulam Robbani. Given that this by-election was caused by someone who also used different spellings for her name at different times (Shelina Ak(h)tar), that’s a little ironic. It seems that barely a week goes by now without an advert appearing in East End Life asking for people to join Mayor Lutfur Rahman’s growing army of advisers. The positions are being advertised here but for those who can’t quite make out the text in the picture, he thinks he needs a “communications and media” adviser and someone to guide him on “branding”. The annual budget for each (probably part-time) position is £30,000, £60,000 a year. Now, how on earth did the council manage in the days before the Great Enlightened Era of executive mayoralty? Granted, its press and communications office wasn’t that great but that’s probably because they were overstaffed and overpaid. Cuts should have been the order of the day, but more is better in the Land of Lutfur. Well, more of his own anyway. It’ll be fascinating to see who wins this supposedly rigorous and open contest. At the same time as he spends more of our money on these non-jobs he also seems to be winning his battle to cut the number of councillors in the borough from 51 to 45. 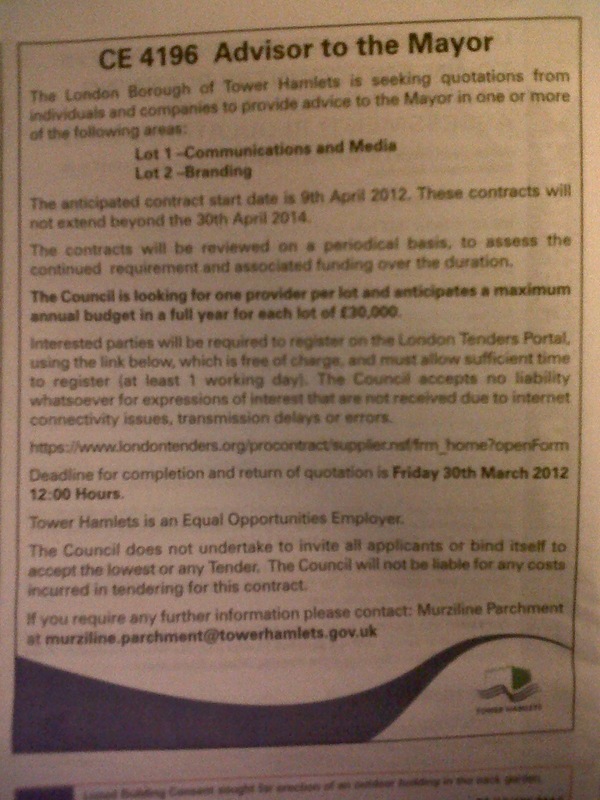 Yesterday the Commission decided to undertake a public consultation on council size for Tower Hamlets. This consultation will start on 27 March 2012 and end on 8 May 2012. Please do let councillors know. Having considered the proposals for council size of 51 (LAB GROUP), 45 (MAYOR), 42 (TORIES) and 38 (LIBERAL), the Commission have decided to consult on a council size of 45. The Commission was of a view that the evidence provided supports the case that the number of councillors could be reduced, and that 45 may be an appropriate number. The Commission carefully considered the arguments made in regard to the representational role of councillors, the scrutiny arrangements, and the delegation of functions within Tower Hamlets Council. Given this, the Commission has agreed to consult on whether a council size on 45 is appropriate for Tower Hamlets Council, and welcomes further submissions during this period of public consultation. I should stress that the Commission has not made a final decision, and that the decision made after this public consultation may be for more or fewer councillors than 45. This consultation period is an opportunity for councillors, political parties, and members of the public to look more closely at the submissions which were originally made, and make additional submissions. All the original submission are on our website at http://www.lgbce.org.uk/all-reviews/south-east/greater-london/tower-hamlets-fer. A further letter will be sent to the Chief Executive on 27 March and copied to political groups and other stakeholders. All the submissions can be found here. Lo and behold Lutfur tells the Commission that his measures will save the council £60,000 a year (hmm, doesn’t that figure sound familiar?) He also says that as a result of the new system of government, councillors have less work to do (so do his cabinet members but they’re still given an extra £13,000 a year – pretty much the same as under the previous system). area. Further reductions in the committee structure have recently been proposed by the Council’s Constitution Working Party. (d) The demands of other functions have also reduced, such as attendance by councillors on outside bodies, reflecting new approaches to this work. Our view is that the current Council size of 51 councillors should be retained because of the increasing demands on councillors in their roles as community leaders, community advocates, and in establishing appropriate levels of scrutiny and holding to account of the elected Mayor. The structure of decision-making in Tower Hamlets has not been revised or considered for revision since the introduction of the Executive Mayoral system. Each committee which existed prior to October 2010 still exists, the number of councillors on each committee has not changed, and the frequency of the meetings of each committee has not changed. How those committees undertake their work has, essentially, not changed following the change to the Executive Mayoral system. In some cases we feel this has led to committees becoming a “work creation” scheme. We have concluded that the number of councillors in Tower Hamlets may be reduced by an amount between one-fifth and one-seventh, and that convenient and effective local government would still be secured subject to a rearrangement of the committee structure. This leads us to propose a membership between forty-one and forty-four. 1. The disparity between the numbers of electors in individual wards in Tower Hamlets clearly demonstrates a need for a review of electoral boundaries. The recent move away from a Leader and Cabinet model of executive decision making to a directly elected Executive Mayor in Tower Hamlets has also changed the way in which the local authority and its elected representatives operate and allows for a reconsideration of the number of Councillors in the new arrangement. 2. Councillors work for and with electors and non-electors in the Borough. The numbers of both have risen since the last boundary review. This might suggest that more Councillors are required to take decisions and represent the community. However, the changes in Council structures in Tower Hamlets over the past decade, from a Committee system, to a Leader and Cabinet model, and now to a directly elected Mayor mean that the role and responsibilities of Councillors have altered. Although I regret aspects of these changes as they have led to a concentration of power to a small group and ultimately one person, the changes do mean that fewer Councillors are involved in executive decision making. 3. The roles of the Mayor and Councillors are vital as the decisions of the Mayor and Council affect the well-being of many individuals, businesses and organisations in the borough. In any review of the number of Councillors it is crucial to take into account the varied work that Councillors do, both in supporting the executive Mayor in his/her decision making; in scrutinising, challenging and improving decisions of the executive, and the performance of the Council; undertaking advocacy on behalf of residents and business; and, representing the Council and the Borough’s interests on outside bodies. 4. The work of a Councillor is demanding and time consuming, and it is important that there are sufficient Councillors available to fulfil the roles detailed in 3. above, and to provide the electorate with a range of Councillors that reflect the community. While it is my belief that most Tower Hamlets Councillors are willing and able to represent people who are different to them, I know from experience that residents sometimes come to me for support because of my gender, ethnicity and/or expressed values. We do not want to risk a reduction in the diversity of age, gender, ethnicity, sexuality, business and voluntary experience etc. of the Council by significantly reducing the number of elected Councillors. 5. Notwithstandingmyconcernaboutalossofdiversity,Iwouldsupporta reduction in the number of Councillors in the authority. I would consider a reduction from 51 to 38 (i.e. a decrease of roughly 1⁄4) to be reasonable. Any reduction below this would risk a diminution in the diversity of representation as outlined in paragraph 4. and a failure to have enough Councillors to fulfil the roles outlined in paragraph 3. 6. A reduction by 13 in the number of Councillors would provide a substantial saving in Councillor’s allowances and reduce the pressure on officers in the Member’s Services department in relation to the support provided to Councillors. A reduction of this order would still enable Councillors to support the Mayor in decision making; to fulfil the Council’s quasi-judicial functions; to scrutinise, challenge and criticise executive decisions and Council performance; and to represent constituents and the Council on outside bodies. Moving away from having all 3 member wards to a mixture of 2 and 3 member wards would help to even out electoral representation within wards and enable ward boundaries to better relate to physical boundaries such as highways and waterways. 7. WhilethepresentexecutiveMayorofTowerHamletscurrentlytakesall decisions not reserved to full Council, the present Mayor and any future Mayor may decide to share executive decision-making with a Cabinet of Councillors. Even with the current arrangements, the quantity and complexity of the Council’s business requires the Executive Mayor to be supported by Cabinet members who are Councillors. Officers can and do provide essential technical and administrative advice, but the role of elected Councillors to reflect the interests and concerns of residents is crucial to ensure informed decision making by the Mayor. Therefore I believe that there needs to be a sufficient number of Councillors to assist the Mayor in decision-making. This should comprise at least one Cabinet post for each directorate of the Council – at present this would comprise 6 although the ‘Adults, Health and Well- being’ and ‘Children, Schools and Families’ directorates are merging which reduces the number to 5. With the legislative requirement for a Deputy Mayor to deputise for the Mayor in the event of the incapacity or unavailability of the Mayor, my view is that the minimum number of Cabinet positions ought to be 6 (1 Deputy Mayor and 5 Cabinet posts). 8. Conclusion: A minimum of 6 Councillors is required to support the Mayor’s executive decision-making. This important committee functions to scrutinise delivery of services, and the decisions of the Executive Mayor. It must have a membership that is sufficient to do this competently and from a range of perspectives. Ideally the committee should have identified members who shadow the directorates (as at present) but with the flexibility to have at least one representative from each political group in Council on the Overview and Scrutiny Committee. Clearly, as a result of this Committee’s executive and performance scrutiny function, members of the Mayor’s Cabinet should continue to be ineligible to sit on this committee. The current representation of 9 Councillors is right given the importance of this committee, the need to scrutinise the Council’s directorates, and the usefulness of a cross-party perspective. The Council is required to have a number of quasi-judicial committees to carry out the work of granting (or not) planning permission and licensing applications. Tower Hamlets is a Borough that has traditionally proven very attractive to developers and many strategic developments have been considered for housing and major infrastructure e.g. Crossrail. Given the Borough’s location and good transport links; the vibrant business district of Canary Wharf; flourishing night-time economy in areas like Brick Lane; and the high level of housing need, it is not likely that the level of demand for development and licensing decisions will drop significantly. Therefore there will be a significant ongoing requirement for Councillors to review, amend, approve and reject applications on the quasi-judicial committees. There is little statutory guidance on the correct number for these committees but the current representation of 7 Councillors on each of the Development and Strategic Development Committees and 15 Councillors on Licensing Committee to provide a rotating pool of members to sit on the Licensing Sub-Committees is right given the workload of these committees. These Committees are important, but several meet on an ad hoc basis or infrequently and therefore the membership of them can be met by Councillors undertaking multiple responsibilities. Most currently servicing Councillors are members of several committees and, with support from a system of designated deputies, manage to fulfil these roles adequately. These committees could have a slightly smaller membership and still fulfil their functions. 12.A minimum of 9 non-cabinet Councillors for Overview and Scrutiny Committee and a minimum of 7 Councillors for each of Strategic Development and Development Committees, and 15 Councillors for Licensing sub-Committees is required to carry out the functions of these Committees. This provides for 38 positions which could be filled by the 32 non-Cabinet Councillors (although the Cabinet members may of course be members of committees except Overview and Scrutiny). 13.Conclusion: The workload of the Council’s Committees could be managed by 38 Councillors (32 non-Cabinet Councillors) with each Councillor being a member of no more than three Committees on average – not including Full Council. 14.Councillors have an important role in representing and advising residents and assisting them to resolve complaints, disputes and submit consultation responses in relation to the work of the Council and beyond. With the change to a directly elected Mayor and the current Mayor’s decision to exercise all executive functions, inevitably some residents will approach the Mayor directly rather than through a Councillor. 15.Nevertheless, where residents, businesses and organisations are opposed to a policy of the elected Mayor, or wish to advocate a particular policy, Councillors have a vital role in promoting, advising and justifying a position on behalf of interested parties. 16.The size of the Council needs to reflect the important role that Councillors have in representing their constituents. The reduction I am proposing in the number of Councillors reflects the fact that the Executive Mayor cannot personally meet with every constituent or group. Likewise the Speaker of the Council (in his/her capacity as First Citizen of the borough) cannot attend every function, meeting and celebration. Having 38 local Councillors as I suggest, means that the complaints and grievances of local residents and business can be heard face to face, and, just as importantly, the achievements and successes of the Borough’s residents can be recognised and acknowledged by the Council through the attendance at events of a local Councillor. 17.The Council and its residents and businesses also need to have a voice in organisations in the local community and across London, and Councillors fulfil an important role representing the Council on external bodies such as the Olympic Development Authority (ODA), and the Reserve Forces and Cadets Association (RFCA) for which I am the representative Councillor. The workload of these organisations fluctuates – for example the RFCA is particularly busy in the build up to HM the Queen’s Diamond Jubilee – and the ODA has naturally been busy in preparation for the London 2012 Olympic and Paralympic games. Other bodies with Councillor representation include housing associations, the Council’s housing Arms Length Management Organisation – Tower Hamlets Homes, and a range of diverse organisations representing business, arts, sports, disability and other aspects of life in the Borough. While the reduction in the number of Councillors I am proposing is unlikely to mean that the Council has less of a voice on these outside bodies, a greater reduction in the number of Councillors would run the risk that the Council, residents and businesses would be unrepresented on these bodies. 18.Conclusion: There is scope for a reduction in the number of Councillors from 51 to 38 without a loss of support for executive decision making; without reducing the quality and quantity of scrutiny and challenge to executive decisions and Council performance; and without a reduction in the representative functions of local Councillors. However a greater reduction in the number of Councillors would be likely to lead to a loss of the resource which local Councillors provide to residents and businesses in the Borough. Of all the cynical moves by the commercial Olympic juggernaut in London over the years, the decision to drop Tower Hamlets from the marathon route was among the most disgraceful. Lord Coe had gone to Singapore 2005 using kids from this borough to persuade the IOC of the legacy benefits the 2012 Games would bring. After we won, politicians started going all gooey about the thought of the marathon passing along the A11 through Whitechapel,Mile End and Bow. There was even talk of renaming the entire road the Olympic Boulevard before the IOC said that would be against their copyright rules. Instead, it was dubbed High Street 2012 and there was lots of talk of using the event to spruce things up. During this time, Lord Coe was probably wondering what he’d got himself into: did worldwide TV audiences really want to see grotty Tower Hamlets buildings as the backdrop? He decided No and announced two years ago that the traffic logistics meant the route was not feasible. Tower Hamlets council quite rightly prepared to take Coe to court under a judicial review. Coe got worried and in May last year, Mayor Lutfur Rahman announced a major deal with the Locog chairman: that in return for dropping the legal case, which the council was tipped to win, Tower Hamlets would be the first London borough to welcome the Olympic torch when it arrived in the capital a week before the opening of the Games on July 27. The Olympic Torch will hit the capital first in Tower Hamlets after a tour around the country. The decision was part of a deal struck in February to compensate for the loss of the Marathon route. The agreement, reached by Lord Coe, chairman of Olympic organiser Locog, and Mayor of Tower Hamlets Lutfur Rahman saw the borough reap a number of cultural and employment benefits from the Olympics. Mayor Rahman, said: “It’s fantastic that Tower Hamlets’ residents will be the first in the capital to celebrate the arrival of the torch in London. It gives everybody in the borough the chance to get involved in the excitement. “And it’s a great opportunity for us to highlight the unique character of Tower Hamlets – showcasing the borough to the world. It will arrive on the evening of Friday, July 20, with seven days to go until the start of the Games in Stratford. Following its arrival in Tower Hamlets, the Olympic Flame will continue its journey to the other host boroughs – Greenwich, Hackney, Newham and Waltham Forest – before it visits every London borough. Lutfur should have gone ahead with that JR.
Today, Coe announced the timetable for the Olympic Torch. The full details are on the BBC website here and here. The Torch will be run through Tower Hamlets on Saturday, July 21, at 1.50pm at the Bow Flyover–having just come from Newham and Greenwich that morning. Hmm. A call to Locog clarifies matters. Technically, Coe is sticking to the letter of his deal with Lutfur because it will actually arrive from Guildford the night before for an evening ceremony at that venue well known for its accessibility to ordinary members of the public…the Tower of London. Not exactly what we all had in mind is it..? Now, was the Torch, which will go to Greenwich very early the next day, ever going to land in London anywhere but the Tower? I very much doubt it. Did Coe dupe Lutfur, or did Lutfur dupe us all when he announced that deal last year? We probably shouldn’t care about such things, but there is a wider point about politicians, including Coe, telling us the full story when they spin their lines. It just ads to the cynicism. Anybody who has been following the fascinating question of why on earth Lord Coe and his 2012 Olympics organising team came to select a company as controversial as Dow Chemical to sponsor a fabric wrap around the main Olympic stadium this summer will be intrigued by a number of Government emails that have been disclosed to me under the Freedom of Information Act. – that the £7million cited cost for the wrap was never in the ODA budget in the first place; it was to be covered from reserves. – and that contrary to what we have been told repeatedly before, the International Olympic Committee were involved in Locog’s wrap deal with Dow “to bring them on as a world wide sponsor”. I have shown the emails to Labour MP Barry Gardiner who wants to put down an Urgent Question to Mr Hunt in the Commons tomorrow. He believes that Mr Hunt needs to explain two main points to the House: a) his own involvement and b) the date when his department knew about the deal. In July 2010, Dow paid an estimated $100 million to the IOC to become one of its worldwide TOP sponsors for the next 10 years. This was a straightforward business decision because it allows the company to push its products onto Olympic Games organisers. There is an element of first option in any supply contracts. At about the same time in July/August 2010, the Coalition was preparing announcements for the October 2010 Comprehensive Spending Review. DCMS wanted the Olympic Delivery Authority to find £20million of savings. In October 2010, DCMS announces that the wrap will be dropped from the ODA budget to save £7million. There is some talk at that stage that the wrap could be retained if private funding is found. In December 2010, Locog reveal they have had a number of expressions of interest for the wrap and in February 2011 an “open and rigorous” tender process is advertised. It offers “sector exclusive marketing rights” in return for supplying the wrap. On August 4, 2011, Dow Chemical is announced as the winner of that process. On Aug 7, the Sunday Express is the first newspaper to report concerns and outrage from the victims of the Bhopal gas disaster in 1984. That story is picked up by the international press, the Sunday Express continues the momentum, it uncovers apparent anomalies and concerns at Olympic Board level and protests and threats of boycotts grow. In January 2012, Meredith Alexander one of the commissioners for the Commission for a Sustainable London 2012, which had been assigned to investigate the Dow deal, resigns in protest at the decision of her chair, Shaun McCarthy to give the deal a clean bill of health. Mr McCarthy then admitted that the processes had not been good enough and recommends to future Olympic Games organisers that corporate ethics should be considered when awarding sponsorship contracts. What almost everyone who has closely followed this controversy finds difficult to fathom is why PR master Lord Coe thought there would be no fall-out from the Dow deal, given the company’s links to Bhopal. Well, very senior Olympic insiders tell me that because there had been no howls of protest from the Bhopal campaigners when Dow became an IOC sponsor in July 2010, they assumed there would be nothing risky later on. They also insist that Dow’s position on Bhopal is legally sound. The pesticide plant in Bhopal was owned by an Indian subsidiary of Union Carbide. Union Carbide made a $470million “full and final” settlement to the gas victims in 1989. It then sold its Indian subsidiary and in 2001, Dow Chemical completed a deal to buy the rest of Union Carbide. So Dow never owned nor operated the Bhopal plant and they continue to highlight that. However, the Indian government and victims continue to pursue Dow through the courts. Among their arguments are that the contaminated groundwater in Bhopal, which still maims children to this day, predates the 1984 disaster; as such, the international principle of “polluter pays” applies and Union Carbide, now owned by Dow, is that polluter. Secondly, the Indian government argues that the number of victims accounted for in the 1989 settlement was vastly underestimated, that the full horror of the 1984 disaster has only become apparent with the passage of time. In many ways it is complex, but there is one simple fact: the pesticide plant in Bhopal has never been remediated and that the slums surrounding it continue to draw water from nearby wells. So that’s the background. Now on to the emails. I asked the ODA for all correspondence it held on the issue of the wrap from July 2010, both internally and with the DCMS and Locog. Some of that correspondence has been withheld on the ground that it would affect “policy advising”. The material that has been released, though, is fascinating enough. On July 27, 2010, David Goldstone, a director at the Government Olympic Executive (GOE) at the DCMS, wrote to Dennis Hone, who was then the Finance Director at the ODA (he was soon promoted to CEO when David Higgins left). He told Hone that “ministers are clear they want all options to be considered” in the CSR, “and that includes opportunities to raise further revenues from non-public sector sources”. On August 4, 2010, Mr Hone writes to his team to say that the GOE have suggested dropping the wrap. “Sorry if this is a stupid idea, wasting your time,” he writes…”I was thinking about why we can’t get the wrap paid for by sponsors – it will be (if we don’t scrap it) one of the most viewed images in the world in 2012; it must be worth a fortune to sponsors to have their logos etc on there. “I assumed it fell foul of ‘clean venue’ requirements – but understand they focus on the field of play, not external. As I assume an external wrap wouldn’t be visible from field of play, that should be ok. So what’s to stop Paul sending the commercial team to auction off rights to a bunch of sponsors each to have images etc on there‐ which would i assume raise far more than the £7m we are talking about saving. On September 20, 2010, Neil Wood, the chief financial officer at Locog, emails David Goldstone to outline Locog’s concerns about removing the wrap. He says the wrap is important for practical reasons, that it would incorporate signs for spectators and that these signs would match the colours on people’s tickets. He says this signage system is “paramount” for gaining a safety certificate for the stadium. “The ODA study does not assess the potential impacts of the changing wind conditions on the Opening and Closing Ceremonies…Locog has focussed on developing an aerial ceremony production, with aerial suspension of performers and scenery. This naturally involves an element of risk to the performers, however Locog will need to assess if the impact of removing the wrap adds further to the health and safety of the performers”. And so in October 2010, DCMS announced that the wrap had been dropped as part of the CSR and that £7million would be saved. In reality, the wrap was never going to be dropped. Culture Secretary Jeremy Hunt made a fortune in publishing before becoming an MP and he was a particular expert with marketing and advertising brainwaves. So fast forward to May 2011 when David Goldstone lets the cat out of the bag. It is May 23 and DCMS are aware that a deal with Dow is imminent and now it’s all about who should take the credit. Note this is May 23, the reference to “a few weeks ago” and to the “SofS”. “The deal with Dow has been agreed but the contract is not yet signed (all contract and commercial terms are agreed). XXXX in LOCOG comms is dealing with any announcement and I have left him a message to call me. was under the impression that LOCOG comms were already talking to GOE/ DCMS press or comms? Dave also said that Neil Wood is in the loop on this and at the Directors meeting where this was discussed an announcement in conjunction with Government was already being considered. To ask the Secretary of State for Culture, Olympics, Media and Sport on what date his Department was first made aware of Dow Chemicals’ interest in sponsoring the stadium wrap for the London 2012 Olympics. Contracting for services and supply of goods to the London 2012 Organising Committee (LOCOG) is a matter for LOCOG, a private company operating independent of Government. On 7 February 2011, LOCOG publicly sought expressions of interest from the private sector to supply the wrap, published on the Compete For London 2012 business opportunities website, with a deadline of 18 February 2011. Following this procurement process, LOCOG informed us they were in the final stages of contract negotiation with Dow Chemicals, on 25 May 2011. The conclusion of these discussions between LOCOG and their suppliers was announced on 4 August 2011, publically (sic) naming Dow as the Olympic Wrap supplier. Mr Gardiner says this is the basis for an urgent ministerial question as we now know that DCMS was aware of the deal “a few weeks before” May 25. We were clear when we decided to drop the wrap to save £7 million from the Olympic budget that private sponsorship was an option to LOCOG if they wanted the wrap on the stadium. While we were aware in the run up to a deal being signed that LOCOG were close to finding a sponsor we did not know it was Dow until May 25. I then showed them the May 25 2011 email and they said it was my “interpretation” that it meant the IOC had been involved. They said that email was “general background” referring to the July 2010 TOP sponsor deal. As I said, murky and complex. Here are the links to the 15 FoI email chains: here, here, here, here, here. here, here, here, here, here, here, here, here, here and here. The East London Advertiser reports that Ala Uddin has been selected as Labour’s candidate for the likely by-election in the Spitalfields and Banglatown ward. We’ll find out today or tomorrow if this is going ahead when we learn whether benefit fraudster Shelina Ak(h)tar is appealing her sentence. This means that the by-election would be a straight fight between Uddin (a former Labour councillor and council deputy leader in 1998 – and a leading member of the historic squatting movement of the Seventies) and Lutfur’s man Gulam Robbani. I understand that Respect’s Abjol Miah, who had been keen to stand, has been persuaded not to because he realises he would split the anti-Labour vote and that “Lutfur needs to beat Labour”. This then throws up a very interesting question of when the by-election will be held. As I mentioned here last month, Lutfur would ideally like it held on a different day to the City Hall elections on May 3 when he will be going around the borough telling people to vote for Labour’s Ken Livingstone. He would find it slightly tricky to also tell people that day to vote against Labour in Spitalfields. Many believe Lutfur would want the by-election the week before on April 26 but would he dare waste thousands of pounds of public money just for an overtly political poll? I’m not sure even he would do that. However, let’s look at the process for calling the by-election. Shelina was sentenced on February 6. She has 28 days in which to appeal: if she doesn’t, she is disqualified. But when does that 28 days end? Is it today, March 5, or tomorrow? I ask this because it is crucial for when the by-election can be held. Under the Local Government Act, once the seat becomes vacant (today or tomorrow), a “notice of vacancy” is then required to be delivered to the chief executive by two electors in the borough, asking for an election to be held. The returning officer will set the date of the by-election and it must be within 35 days of receipt of this “notice”. Saturdays, Sundays, Christmas Eve, Christmas Day, Good Friday or a bank holiday and a day appointed for public thanksgiving or mourning are excluded form the 35 days. So, get out your diaries. Start counting 35 working days from tomorrow and you see that the 35th day is actually Thursday, April 26. In order for there to be a by-election on May 3, the signed notice would have to be delivered a week tomorrow at the earliest. Remember also, the legislation states “within” 35 days of any notice. In theory, the by-election could also be held (just about) on April 12 or April 19. In any case, can Lutfur control what two electors might do off their own back? He could just say it had nothing to do with him. One last thing: at some point Ken Livingstone will no doubt come to Tower Hamlets to campaign. I wonder who he will urge people to vote for if asked: Labour, or Lutfur’s man? Not a very convenient by-election this one, is it.